Coley Viselli (19 points) shoots a three. She made five long ones. 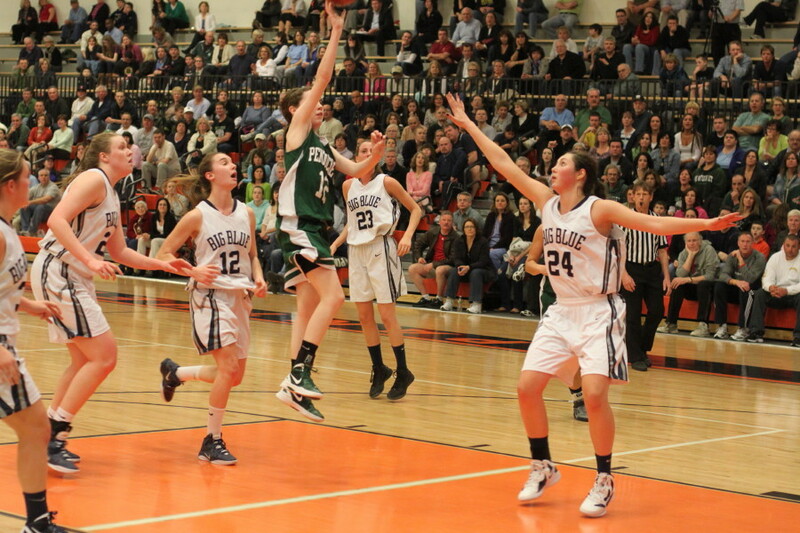 Tess Nogueira (12 points) finds a way to the basket. (Beverly) No one expected a game like this. 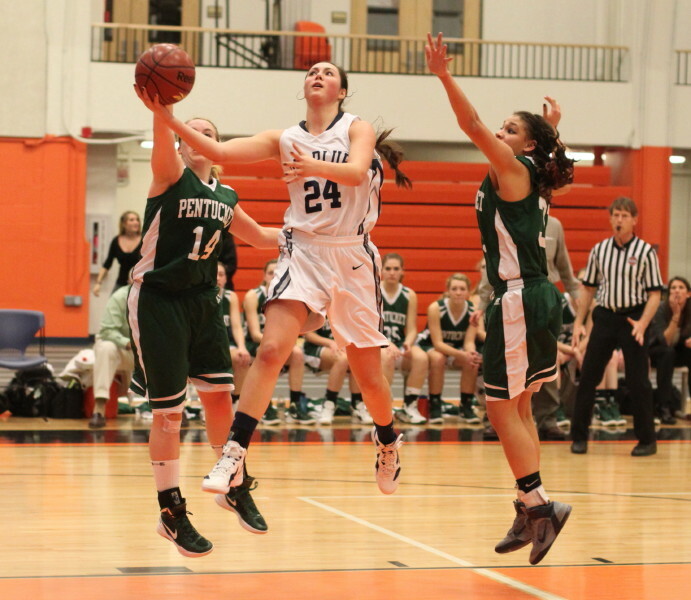 Swampscott (18-4) was embarrassed by Pentucket, 53-27, on Thursday night at Beverly High School and now the Sachems move on to the Division 3 North finals on Saturday (10:30AM) at the Tsongas Center in Lowell against familiar Cape Ann League foe Ipswich. 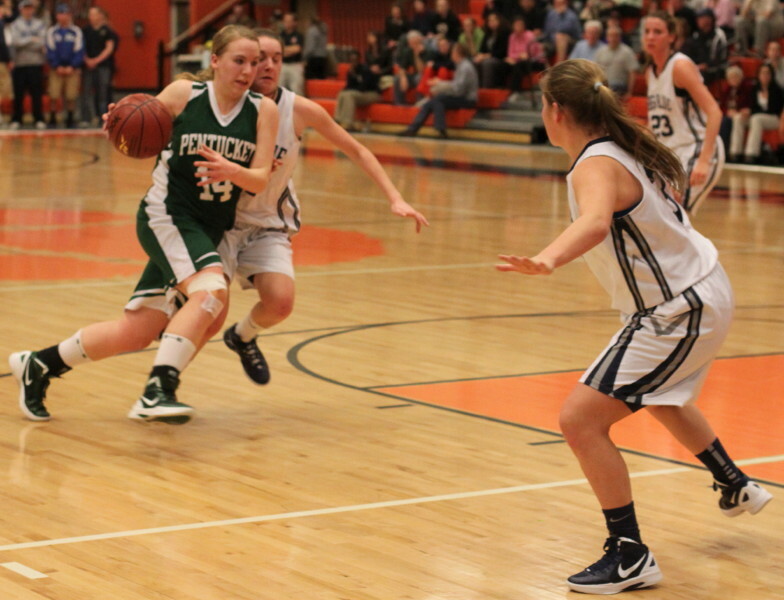 The game was certainly a lot easier for Pentucket (#3 seed) because Coley Viselli (19 points) was honed in from long range. Who cares if one went in off the backboard (end of first quarter) and another took a high bounce off the rim and dropped in (start of the 4th quarter)? All five that the talent junior made, counted. Kelsi McNamara (8 points) hit two other triples. 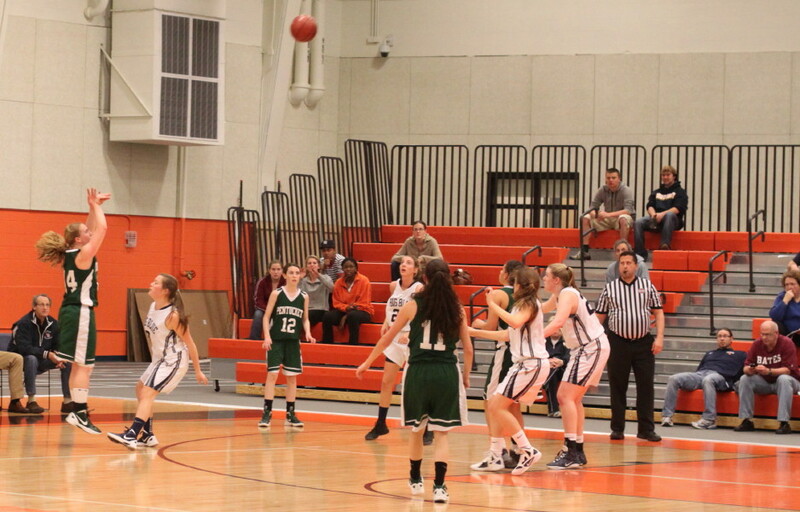 Pentucket’s outside accuracy forced the Big Blue zone to stretch toward the perimeter and opened the inside for Tess Nogueira (12 points) and Sarah Higgins (9 points). It took Pentucket a while to get going but Coley’s backboarded triple gave them a 7-6 first quarter lead. They would never trail again. Coley Viselli heads for the basket. Coley hit her second three to start the second quarter. Then she took a Big Blue turnover in for a layup. She followed that with another triple assisted by Kelsi McNamara. 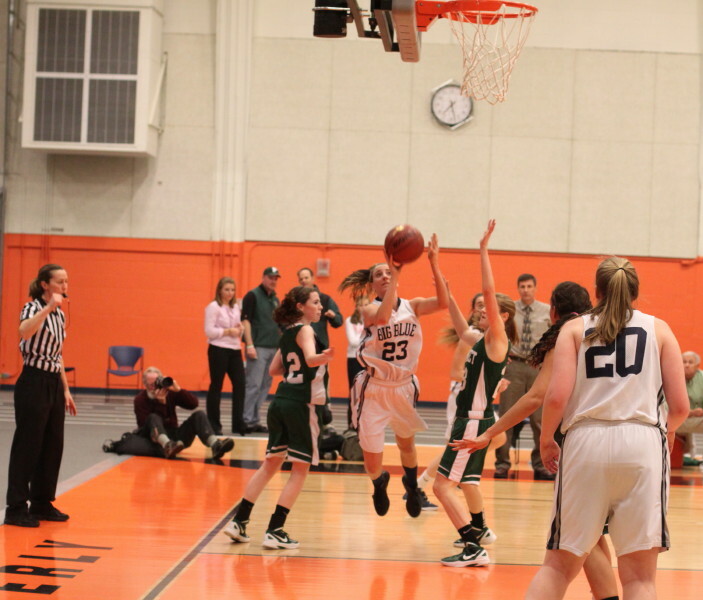 That was all in the first 1 ½ minutes of the second quarter and was part of an eleven-point run that extended the Sachems lead to, 15-6. By the time the second quarter ended Kelsi had added her two long ones, Swampscott had eight turnovers, and they were in trouble at halftime, 25-12. I was sure that the #2 seed was much better than what I had seen in the first half. 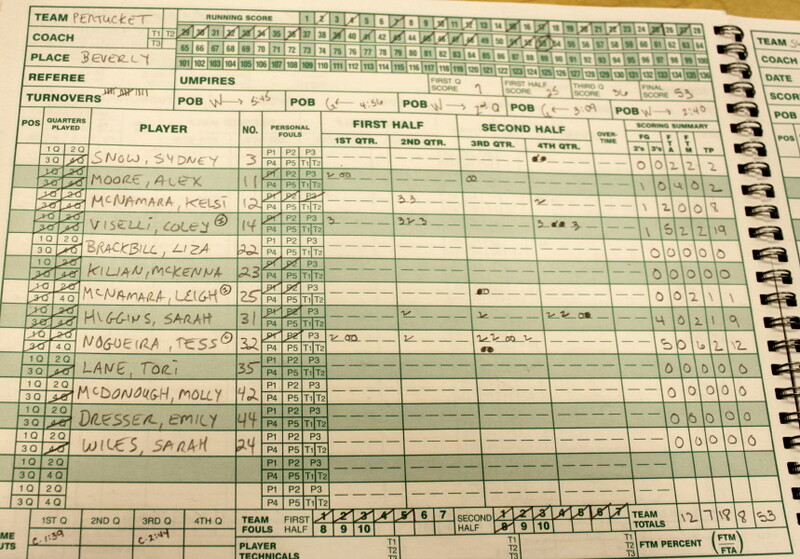 The local papers had stories about how big the rivalry was and also Niki Laskaris, who had twenty-six points against Stoneham, had only two points in the first half. The Big Blue did make a response. 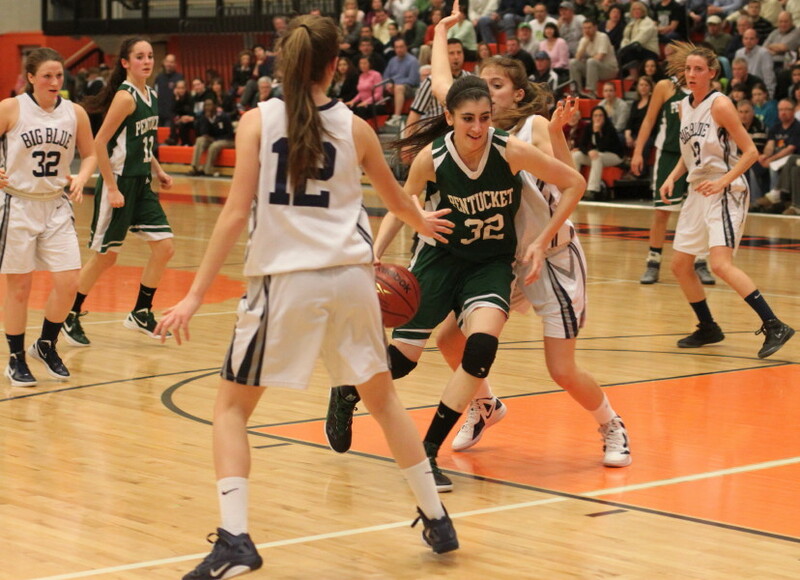 Niki had six points in the third quarter and her layup with 4 ½ minutes left cut the Sachem lead to 29-21. Ara Talkov (11 points) gets to the rim. But that was as close as it got. 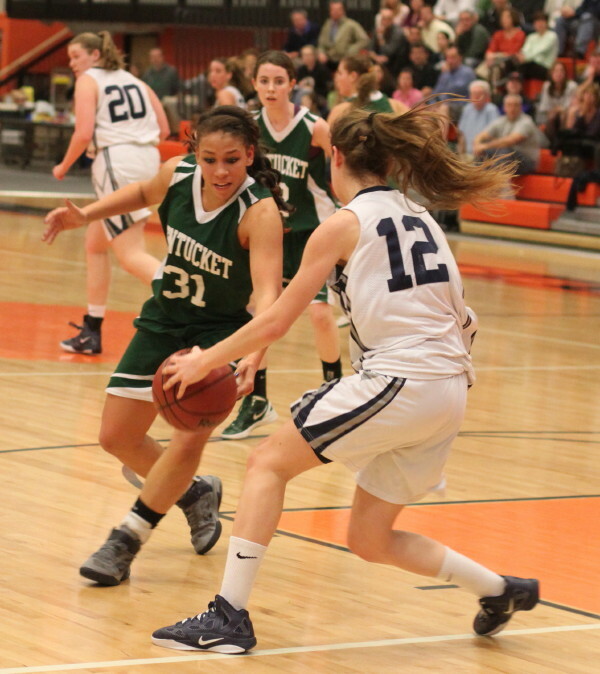 Over the next six minutes of playing time, extending into the final quarter, Pentucket put a 14-2 run together and turned this game into a 43-23 rout. Almost all the damage in this winning segment came on the inside. 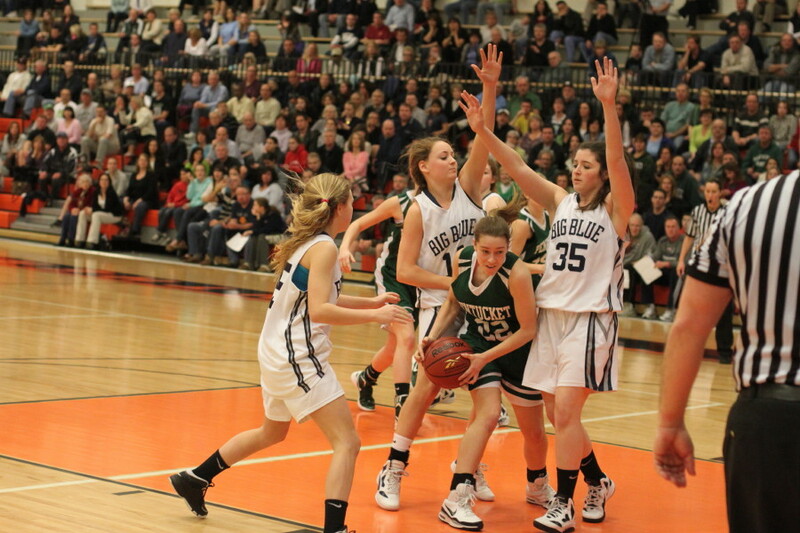 Sarah Higgins (9 points) got three layups and Tess Nogueira one. Tess also had two free throws. And Coley drained her fourth triple. 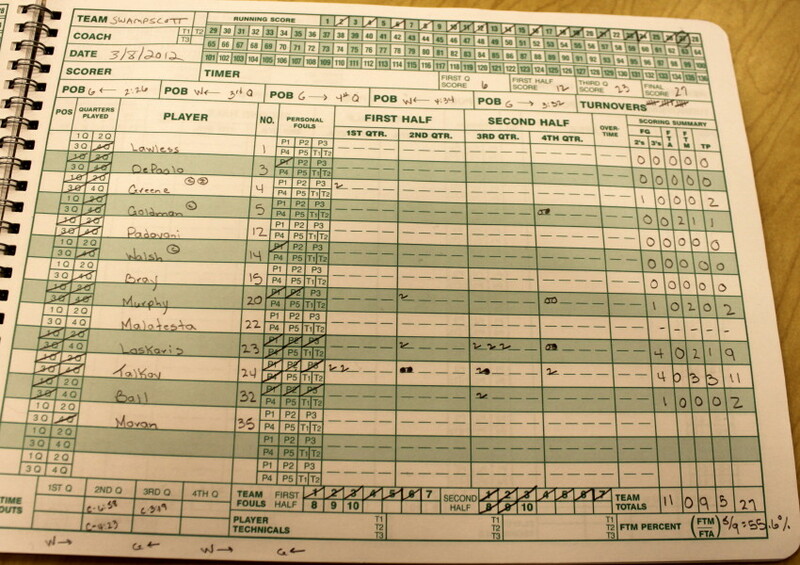 The last 6 ½ minutes of the game were played by a fatigued and frustrated Swampscott team that on this day did not have the energy to make any sort of late challenge. 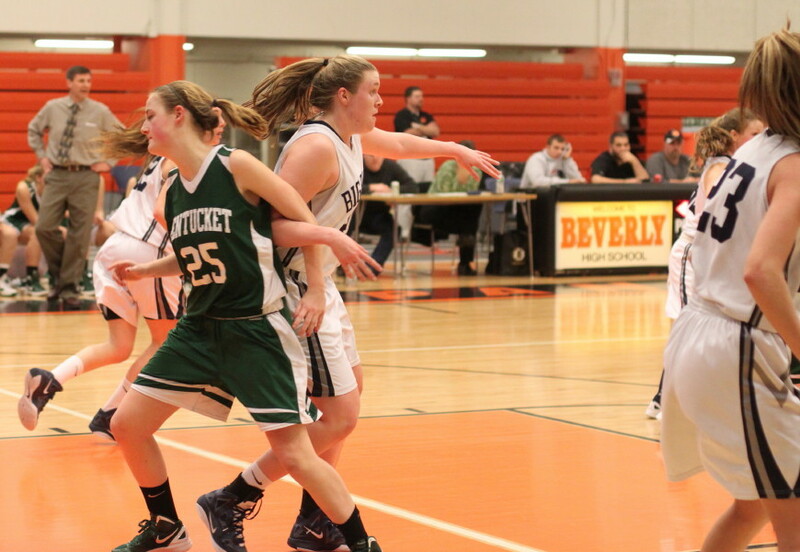 Junior Ara Talkov (11 points) and Senior Niki Laskaris (9 points) led the Swampscott scorers. 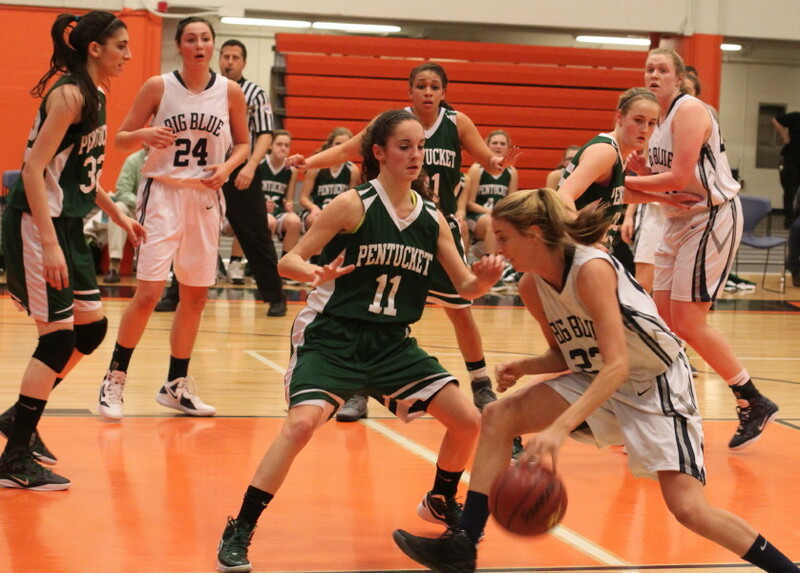 Pentucket (20-4) defeated Ipswich (Saturday’s D3 final opponent) 42-27 on January 24th at Pentucket. The entire Ipswich team was on hand for the Pentucket/Swampscott game. Late in the game, the Pentucket student section started chanting, “We want Ipswich, We want Ipswich.” I’m not sure if they knew that the team they wanted was sitting to the left of them in the same section of seats under the basket. Alex Moore, Tess Nogueira, and Sarah Higgins were all given medical attention during the game. Alex was limited to two points. With Coley on fire, Alex’s usual point production wasn’t needed by the Sachems. Pentucket has now won twelve straight. I’m not too keen on seating under the basket on both ends. Okay, I’m selfish because that’s where I like to stand to take pictures. In this game I was forced off to the side. Credit the Swampscott student section for hanging around for the entire game and enduring the “Scoreboard, scoreboard,” chant from the Pentucket kids. Tougher still was the variation of “It’s all over,” that came out, “It’s a blowout,” as the Big Blue deficit reached twenty points. 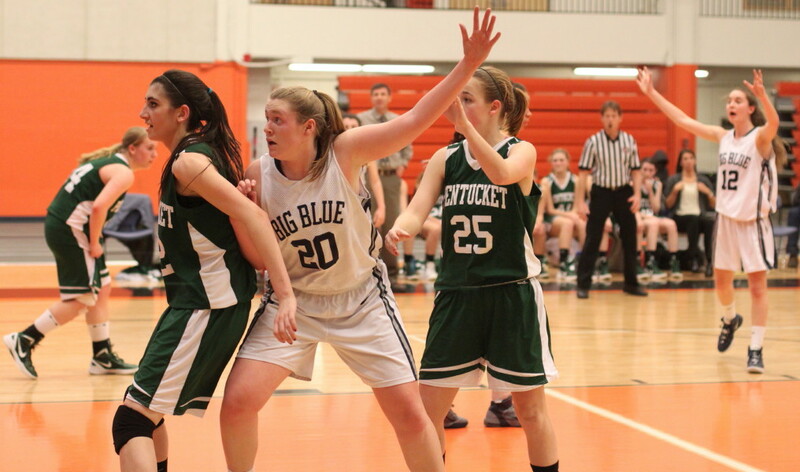 Kelsi McNamara (8 points) puts up a runner.